Finally (finally!) I've managed to spend a whole day painting - woohoo! So what did I do? Well, I finished the two back views that you could see a couple of posts ago but they are now at the framers so aren't in this pic. I'm very pleased with them, which is good as they are the first paintings done entirely post-op and as part of the new project. I also got started on a new little portrait and put a basic layer of colour on all the paintings I had started the week before. In the coming week I hope to finish at least a couple of these. 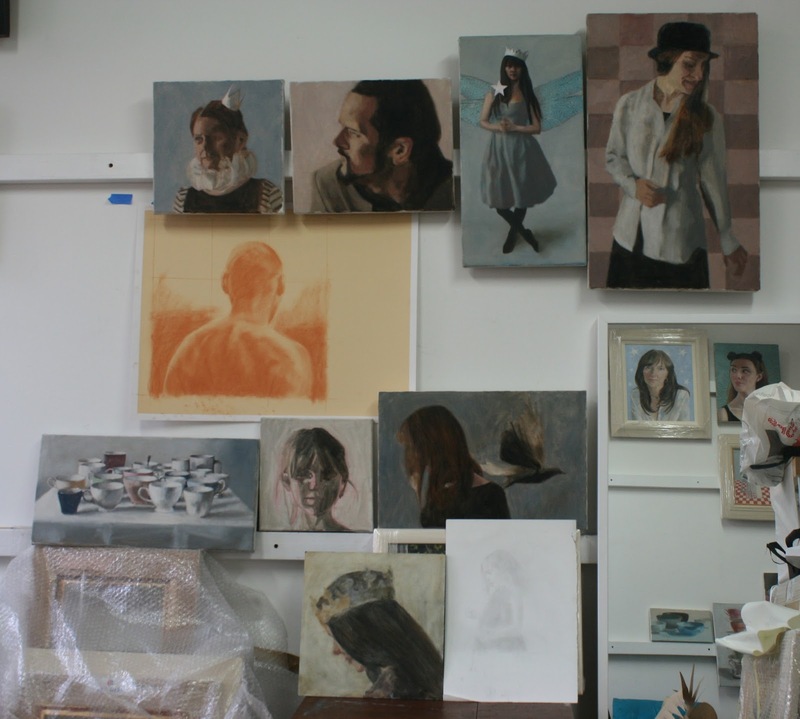 And I did some work on paintings that have been up on the wall for months - there's a little more to be done with the still life and a lot for the girl with the hat. The dragonfly winged lady though is done which is a relief as she has been causing an awful lot of trouble and at once stage I was worried she was just on too small a scale for me. But in the end it was the colour that needed balanced more than anything. What else? two new models and two new drawings as well as the start of a studio clean/re-organisation and a trip to Edinburgh - it's been a busy week!